Prue, first on the left, along with the other U.S. participants pictured in front of the Blue House, the executive office and official residence of the South Korean head of state. 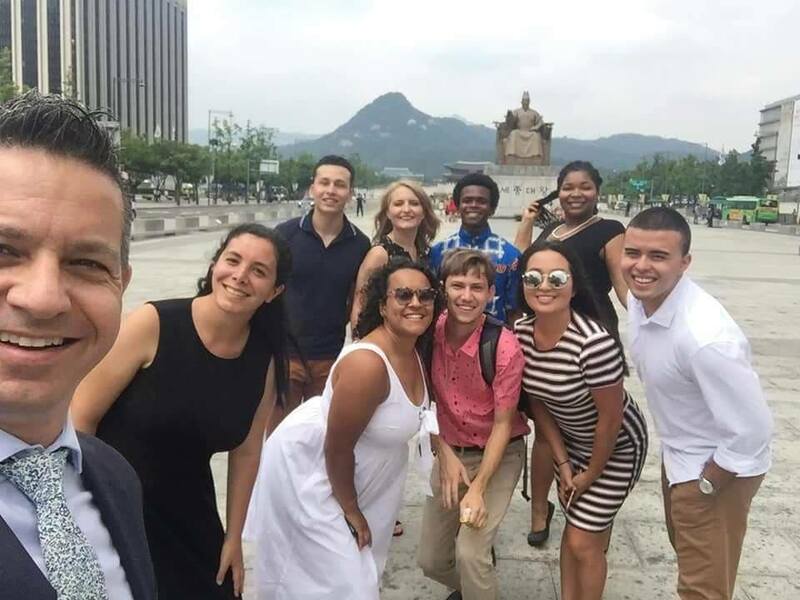 Following below is a blog by one of the U.S. participants in the program, Jacob “Prue” Benson, written at the conclusion of the program in which he shares his impressions of Korea and of the program, his experiences and the lessons learned along the way. Prue, a native of Georgia and currently a student at Georgia State University studying Public Management and Policy, was nominated for this program by Congressman Austin Scott who represents the 8th District of Georgia. “Before I left for the trip, I had only a general sense of what Korea and the world outside of the United States was like. I had seen the movies, read the articles and done the research. I had on paper a good idea of what to expect. After leaving the country for the first time and coming back; I realize that the general idea that I had of the world is an excellent way to prepare for going overseas but is not a substitute for it regarding understanding and learning. 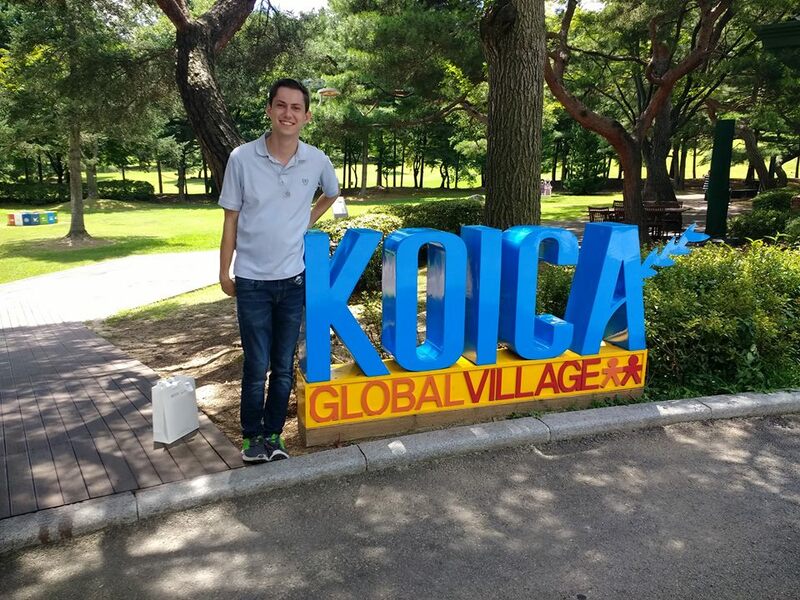 Jacob “Prue” Benson pictured at the Korea International Cooperation Agency (KOICA) Campus. Ever since I was a child, the big city had interested and excited me. Due to the location of my hometown, trips to large urban centers were very rare until I began attending Georgia State University in Downtown Atlanta. It was thrilling to see how the Megacity of Seoul moved. The only other mega-city I have ever visited is New York City, although it pales in comparison to Seoul in my opinion. Visiting Seoul was everything I had hoped for and more. I gained much knowledge about urban affairs, and in the future, I hope to put to use serving American cities. 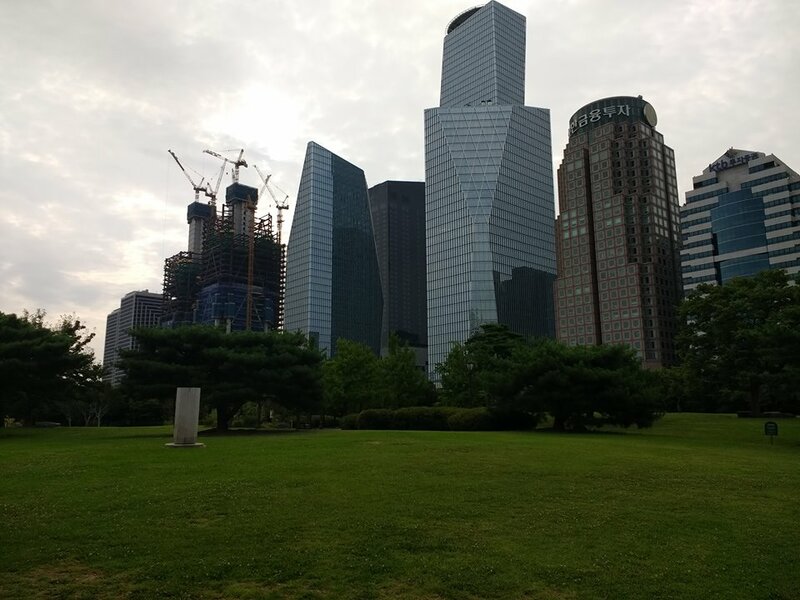 When I was in Seoul; I saw a dense, development-friendly city that enhanced the lives of its citizens. 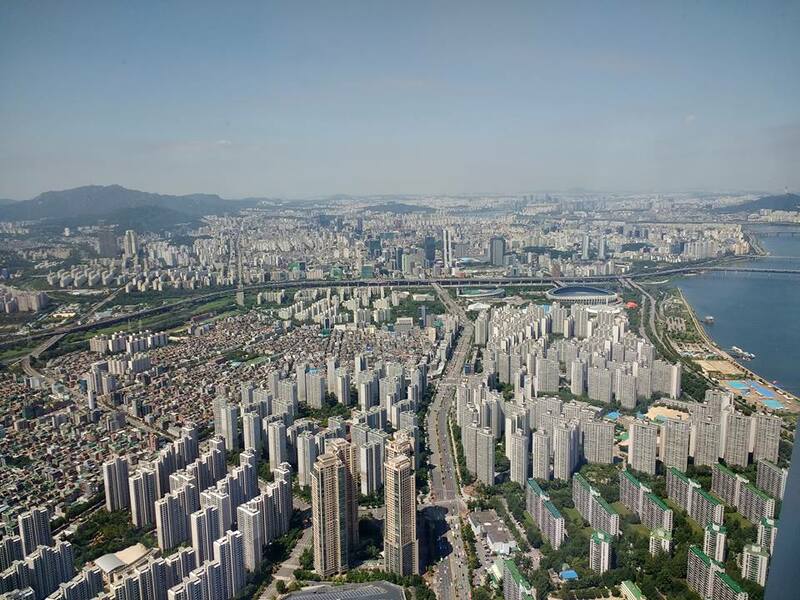 A view of the Songpa (foreground), Gangnam (center), and other neighborhoods (Background) in Seoul. The Han river is to the right. In particular, I saw liveliness among older adults that I have not seen elsewhere. It was remarkable to see groups of 3 to 6 seniors, mainly older women, exploring the city together like they were young. Seoul almost seems like a paradise for senior citizens. In both American and Korean subway systems, there is a part of the train that is reserved for the elderly and disabled. In Seoul, this served not just as a guarantee that elderly people will have a place to sit, but also as a social club since everyone sitting there was around the same age. It seemed to be very taboo for people to sit in these seats who were not elderly or disabled; people would stand rather than sit there. My favorite parts of Seoul were the alleyways and side streets. 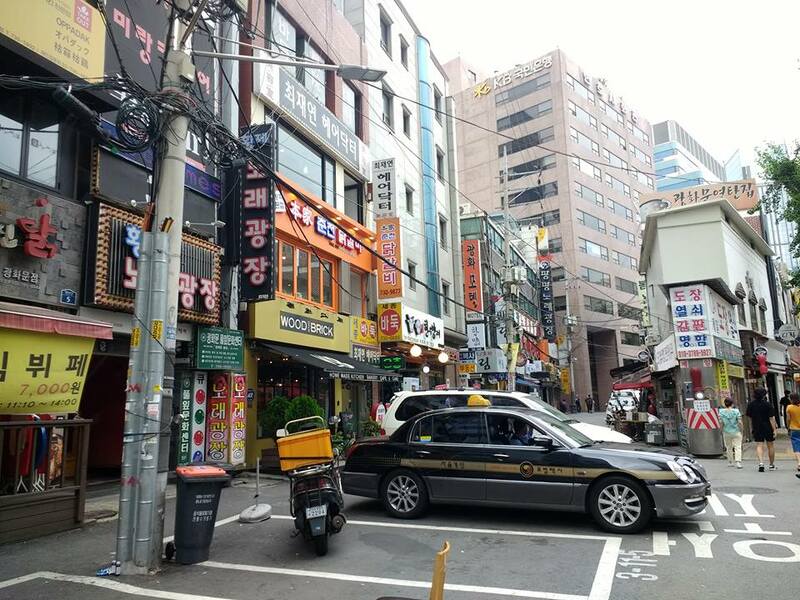 Until this trip, I only knew them as a place where garbage and criminals lurk; in Seoul, they are the main part of urban life. While cars were allowed to go down these streets, it was rare to see them, and you can walk in the street freely. Of course, there was no sidewalk most of the time, so you did not have a choice. It seems like Seoul has done an excellent job developing not just its housing stock but its commercial stock as well. It was very common to see retail space stacked 3 to 4 stories high, as opposed to the street level only standard in America. As a result of what I assume is low rent for commercial space, I found plenty of affordable dining options and places that sell inexpensive goods. I visited one building where the first four floors had different shops geared towards young people; selling things like figurines, comics, and games. It was thrilling to see what new experience each flight of stairs held for me. A side street with retail on multiple floors. The massive amount of retail space could be a contributing factor to the vast array of affordable dining and shopping options in Seoul. One topic I wrestle with on an academic level, and one I hope to grapple with on a professional level, is how our cities are becoming ever more expensive to live in and visit. Places like New York, Chicago, and Washington, DC are becoming playgrounds for the rich while pushing out working class and middle-class residents. Visiting Seoul gave me renewed energy to fight this battle, as I saw firsthand that you could have a big city, with a high quality of life, that is affordable for all. 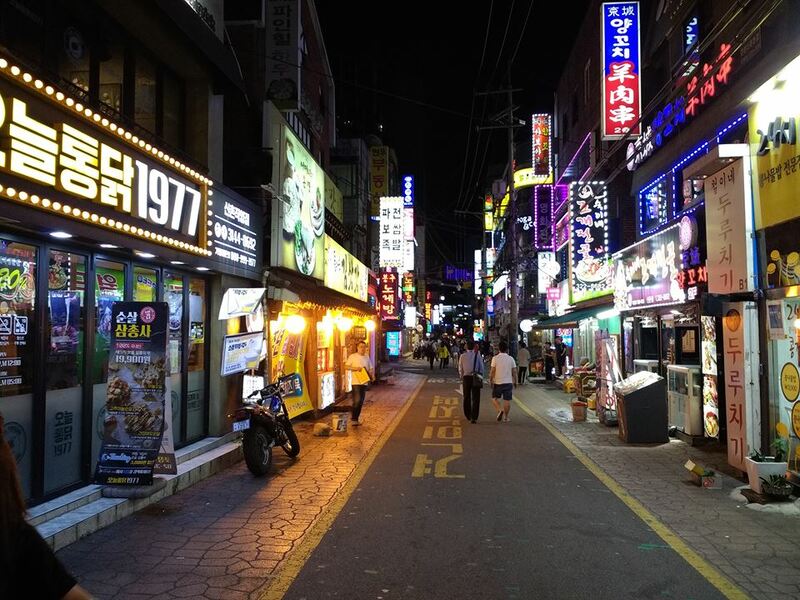 Nightlife in Seoul is very vibrant with many options, both luxury and affordable. The lessons did not stop once we left Seoul. All my life I have only seen agriculture from a Southern United States viewpoint. It never really occurred to me that there were other ways to do it. 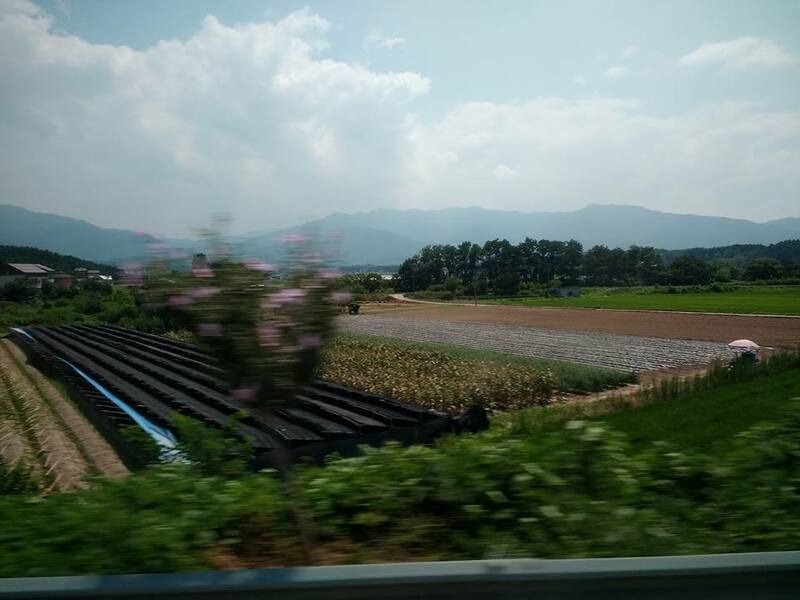 The way that South Korean farms are tucked into every piece of flat land was beautiful to see. Since the plots of lands are small, I saw many people harvesting by hand. Except for a few crops, such as watermelon, this is a rare sight in almost all U.S. fields. Pictured from a train, a field in the Northeast part of the country. The mountains in the background are a great contrast to the agricultural flatlands of the United States. This trip has shown me that South Korea is indeed a special place, filled with extraordinary people. They should not be known just because of their northern neighbor, because the culture and cities of South Korea are remarkable. As a result of this experience, I would like to travel more, especially abroad. As I start my last semester of college and begin looking for jobs, I will look especially close at those jobs that occasionally require travel. This trip has affected my goals in life in that regard. 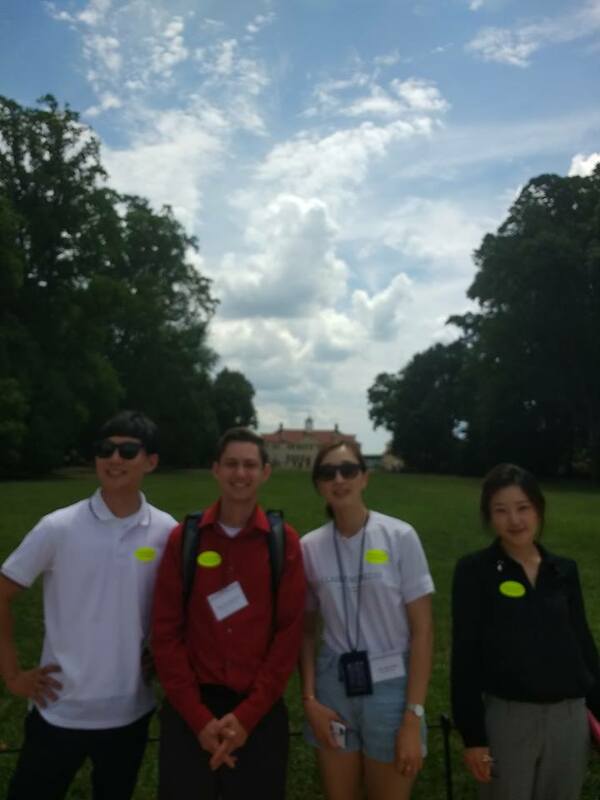 Prue and his Korean counterpart Jisoo Kim (center) along with two other Korean participants, pictured while visiting Mt. Vernon. Almost all of our meetings were extremely informational. The speakers were very knowledgeable, especially in Korea; and the language difference was not much of a barrier at all. It was fascinating to learn about the battle for control in East Asia. A great struggle between tyranny and freedom is taking place all around the world. It will be up to the leaders of tomorrow to win it. The U.S. participants in the program pictured in Gwanghwamun Square in the center of Seoul. POST TAGS: Capitol Hill, Exchange, Global Leaders, International Exchange, Korea, Meridian Impact, South Korea, U.S. Department of State, Youth.